Built in A.D. 1472 by Mahmud Gawan, a Persian scholar and minister of Mohammed Shah II. It was an Islamic college having lecture halls, library, mosque and ample accommodation for both students and professors, built in the same architectural style as that of Persian university buildings. The building covered a rectangle 205' X 180', with a quadrangle in the centre onto which opened the halls and chambers which surrounded it on all sides. 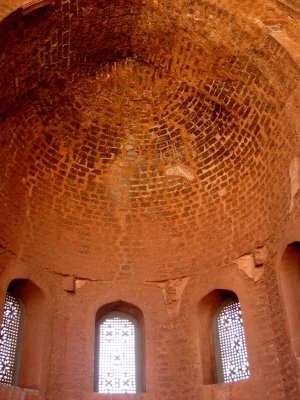 Externally, three of the sides have prominent octagonal projections in the middle which are covered by a 'Tartar' dome. The fourth side contains the entrance and has two tall minars in three stages, one in each corner. 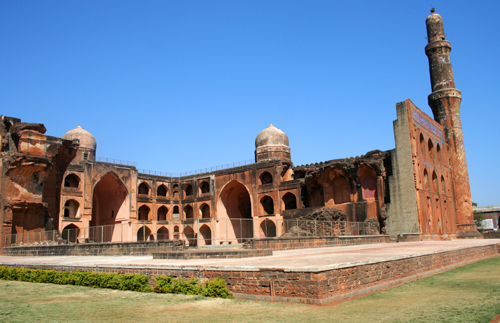 The entire elevation is in three storeys of arched openings surmounted by a wide parapet. In true Persian fashion, the building depends mainly upon surface treatment for its effects and the walls are specially prepared for it. Most of the surface treatment is composed of colour produced by glazed tiles. Schemes in white, green and yellow showing floral patterns and arabesques. A great emphasis is placed on decorative inscriptions, such as the lettering on the parapet done by expert calligraphers which is over 3' high. The foundations of the building show that sheets of lead were interposed between courses of masonry to prevent damp from injuring the tiled surfaces.